A MET FORENSICS specialist who, alongside an Irish scientist, developed a groundbreaking fingerprinting kit used to identify illegal elephant poachers is to be honoured for the development. An estimated 100 African elephants are killed every day by poachers seeking ivory, meat and body parts. The high demand for ivory products has made the illegal ivory trade incredibly profitable and has led to the slaughter of tens of thousands of elephants through the years. Until two years ago, it has only been possible to extract and keep fingerprints from ivory for up to two or three days, because of how porous it is. Wexford native Dr Leon Barron (36), who works at King’s College London, teamed up with Mark Moseley, a forensic specialist with London’s Metropolitan Police, to develop the new fingerprinting technique. Moseley approached Barron to develop the kit after being challenged by his two daughters to find a way to save elephants. The kit has made it possible to obtain fingerprints from elephant ivory which last for up to 28 days. Speaking to TheJournal.ie, Barron explained how the fingerprinting kit works. He said that an elephant ivory tusk has a lot of tiny holes in it, which means it’s very good at keeping itself clean. “If somebody handles an ivory tusk, anything that’s left on it, like sweat, usually soaks into the tusk over a fairly rapid period of time,” he said. The standard way of getting fingerprints from a surface like that would be to use a powder. “We also used a powder but it was a much smaller, finer powder. The powder itself needed very little to stick to in the first place because it was so small,” he said. Barron explained that the fingerprints, which only remained visible on ivory for up to three days before this development, now remain clearer for a lot longer because the small powder is able to stick to the tusks better. The extended period of 28 days gives enforcement officers more time to gather evidence of the ‘middlemen’ who have handled the ivory, whether to weigh, pack or sell it on, as well as those responsible for organising the poaching in the first place. Barron said that himself and Moseley had their first major trial of the fingerprinting kit in Kenya earlier this year, which proved successful. Now, the kits are being used in 15 countries around the world. “Since then in Kenya, we’ve had 15 arrests and around five of those were police officers,” Barron said. I had no idea it would blow up this much. Barron noted that fingerprinting isn’t used in the vast majority of African countries and that they don’t have the capability to use the method for tracking crimes. However, the ivory kit may change that. “The nice thing about the powder for ivory is that it’s pretty good on a lot of surfaces, not just ivory, and we might have a way of getting capability into the continent for all crime,” he said. Moseley this week received a national award from the International Fund for Animal Welfare, who is now providing funding to send the kits abroad, for his work in developing the kit. 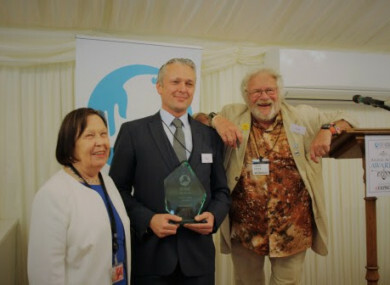 The IFAW Animal Action awards were held at the House of Lords, and hosted by conservationist and TV presenter Bill Oddie. Speaking after the awards, Mark said: “I’m very proud to receive this award and want to thank my colleagues in the Metropolitan Police Service’s Forensic Science Imaging Team, the Fingerprint Bureau and the Wildlife Crime Unit who loaned ivory for testing, as well as the United States’ Embassy in London and IFAW. It has been a rewarding experience and I would recommend anyone to use their skills and knowledge in order to help a cause you are passionate about. Email “How do you get a fingerprint from an elephant tusk? Award for groundbreaking project”. Feedback on “How do you get a fingerprint from an elephant tusk? Award for groundbreaking project”.